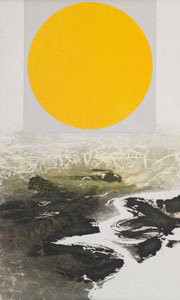 Mid-Autumn Festival, 1969, by Liu Guosong (Chinese, b. 1932). Ink and colors on paper. Asian Art Museum, 2003.22. © Liu Guosong. Photograph © Asian Art Museum. Repeats every week every Friday until Fri Dec 02 2016 except Fri Nov 25 2016. Where did modern Asian art come from? What is contemporary Asian art? Sign up for this lecture series and find out! Inspired by the recent exhibitions Looking East, 28 Chinese, and First Look, the Society for Asian Art’s Fall 2016 Arts of Asia lectures will explore how Asian art has been transformed from the past into something new and relevant for the present in the 19th to 21st centuries. The series will start with a two-lecture overview covering important 19thand 20thcentury art movements, such as impressionism, surrealism, abstraction, and conceptualism. Prominent scholars like Joan Kee and Ming Tiampo will then examine the development of late 19thcentury and early 20thcentury pre-war Asian art from areas like Meiji Japan and colonial Southeast Asia through post-war movements like the Gutai Group in Japan, the '85 New Wave in China, and Korea's Avant-Garde Association. The legacy of classical Chinese traditions, Indian nationalism, and Islamic attitudes toward art will also be considered against the backdrop of modernism, concluding with an examination of globalism, new media, and biennials.